Twitter, Facebook and Co-Good for Teens and the First Amendment? October 1, 2011 0 comments on "Twitter, Facebook and Co-Good for Teens and the First Amendment?" According to the Knights Foundation, as the social media platform has grown amongst the youth, so has the appreciation for the first amendment among them. So is a social media platform good for them? Many tend to be of the opposite view. They believe that no matter how good this platform may be, it is not ideal for children or teenagers to be exact. 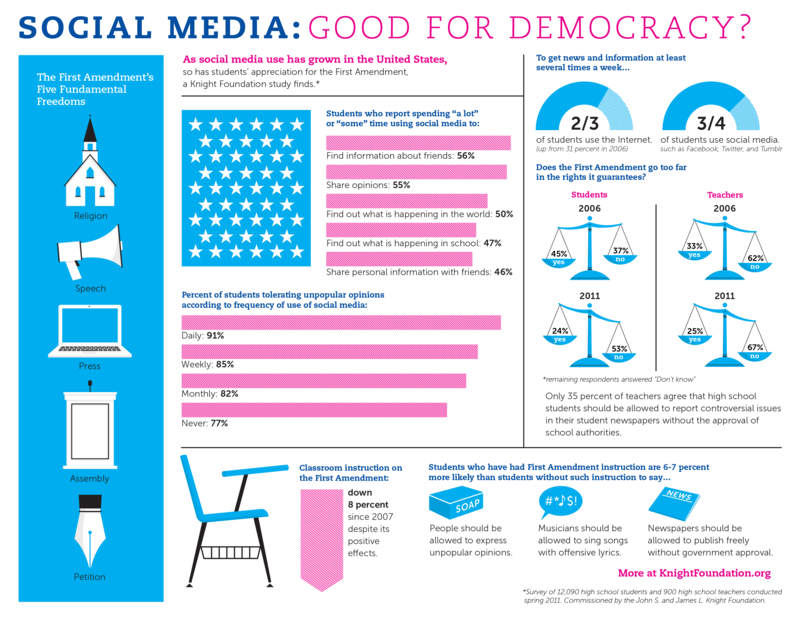 This infographic called “Twitter, Facebook and Co-Good for Teens and the First Amendment?” sheds light on the whole issue. As is seen, according to this infographic, even though children tolerate diverse opinions on the social networking platforms, they are not seen following the first amended rule in their classroom environment. So, what difference has it made in the lives of the children? Many teachers are doubtful about the positive impacts of this platform among the youngsters. If you want to have an unbiased opinion and weigh both sides of the coin, then this infographic will be of great value to you. It has depicted such larger concepts in such an understandable manner. Even the children who are of that age will be able to understand and judge their own scenario with the help of this infographic. It is one of the most important questions in today’s time. Not only children but adults too face the same thing online. But has the world become more tolerant towards another’s opinion? This is the burning question of the hour. Let us have a look to see what this infographic suggests. The description is very neat and clear. As social media’s popularity grows, so does First Amendment appreciation – yet many teachers don’t believe social media help students learn. Source – ColumnFiveMedia. Previous Previous post: Who is Cheating?